The Enchanted Wedding Ceremony Package is a beautiful garden wedding setting designed to show case the magic of the outdoors and leave your guests spellbound with elegant decor and intimate charm. 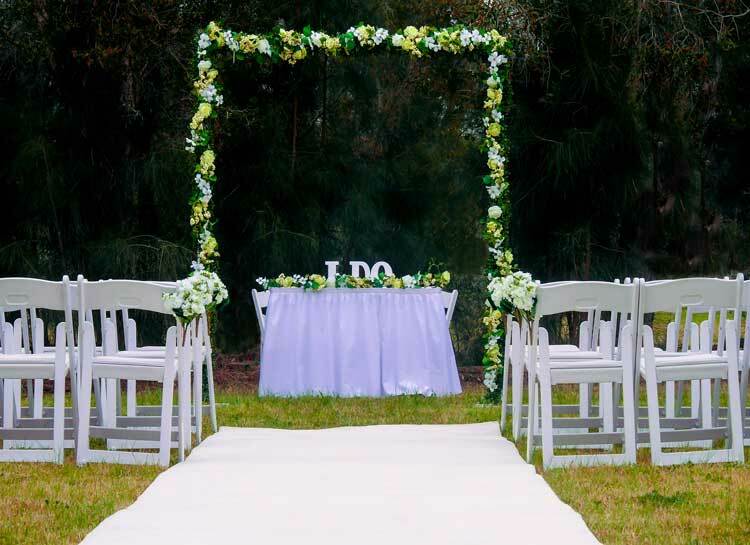 The ceremony package looks particularly stunning within a garden wedding venue that is surrounded by greenery but none the less gorgeous at any outdoor wedding venue whether it be the Royal Botanic Garden Sydney or your very own backyard. The floral wedding arch is a key feature of the enchanted wedding package with its decorative white flowers surrounded by lush green leaves. The arch is completely covered with flowers giving it an enchanted or spring feel. The wedding package includes matching floral arrangements for the signing table and aisle chairs to complete the setting. 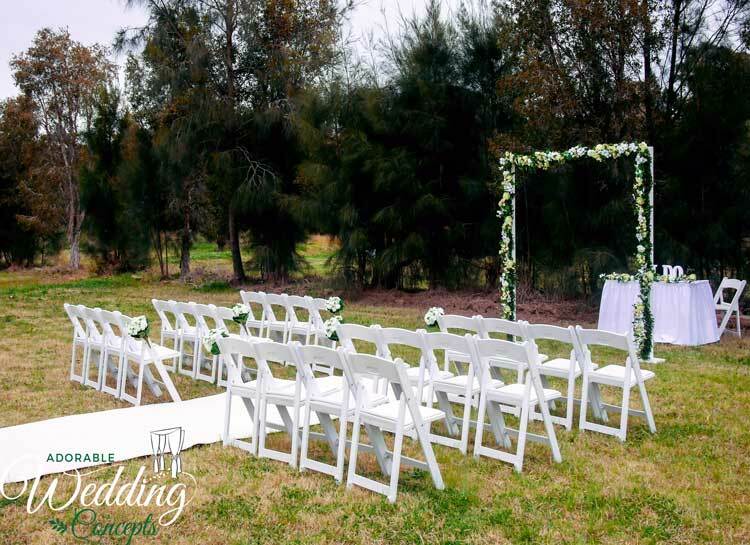 For larger weddings, enquire about adding extra chairs or a longer, 9m x 1.5m ceremony aisle. 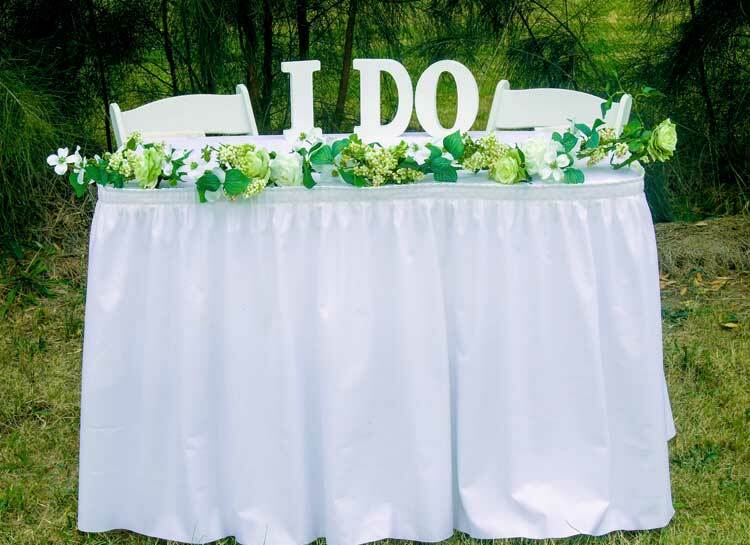 Additionally, if you are looking for the ultimate wedding ceremony prop our large LOVE LETTERS are ideal for wedding photos. Adorable Wedding Concepts love styling and creating wedding packages. We have a range to choose from or alternatively you can custom style your own from our product range so it matches your wedding theme. Adorable Wedding Concepts have a range of wedding decorations to suit outdoor and indoor weddings. Our garden wedding ceremony decorations are mostly custom made to ensure they are suitable for all weather conditions. You can discover more one our PRODUCTS page. Adorable Wedding Concepts have been styling wedding ceremonies for over 15 years and we have covered just about every garden wedding venue in Sydney and some further afield. If you are seeking recommendations we have a list of some of the more popular GARDEN VENUES to help with your decision or you can contact us and we would happy to discuss your requirements and offer recommendations.